A vinyl time capsule has returned to haunt me. It happened that I squirrelled away a bunch of records in Dad’s loft in an attempt to free up some space in my cluttered flat. This was long enough ago for me to forget all about it. But when Dad cleared his loft, it pleased him to return my LPs. He entrusted delivery to brother Ant, who drives a car. The lapse between commission and execution lasted a year, until finally, just before Christmas, I took receipt of eight cardboard boxes containing around two dozen LPs apiece. I had mixed feelings about this. What might I find? My record collection is anyway a refuge for the unloved and unwanted. Rejects from the Mike Butler Home for Vinyl Waifs and Strays must be very, very bad indeed. Or so you might think. Duke, in nature as in name. Where should this music be? i’ the air or the earth? Resolutely lo-fi, in fact, but clearly a magical night. Mahalia Jackson fell into the clutches of small labels too, but majors abused her talents more grievously. Here, the Columbia (GB) and Columbia (USA) mix-up becomes a live issue, because Mahalia Jackson appears on both labels. Columbia (USA) – let’s call them CBS for the sake of clarity – were the worst for turning sanctimony into saccharine. My Faith, CBS 62944, burdens the great gospel singer with a choir and strings, plunders Chopin (‘Tristesse Etude Op. 10 No. 3’ appears as ‘My Faith’, credited to ‘G. Howe/A. Hansen’), wilfully ignores the scepticism of ‘Lost in the Stars’ and is generally tailored to the tastes and pieties of Middle America. Garden of Prayer, CBS 62841, is heading that way – the choir on track one, the title song, sound impeccably clean-cut, starchy and white – but matters improve. 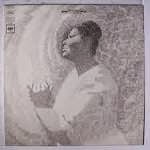 Indeed, Garden of Prayer rivals Mahalia’s pre-CBS recordings on Apollo. These were licensed in the UK by Columbia, the EMI subsidiary. No Matter How You Pray (Columbia 33SX 1712) – dig the eerie organ! – and In The Upper Room (Columbia 33SX 1753) clearly derive from the same sessions. The World’s Greatest Gospel Singer (Philips B 07077 L) is best of the lot. Mahalia always excels with a small combo, and any record with the legend “accompanied by the Falls-Jones Ensemble” is a guarantee of excellence. As Sister Rosetta Tharpe is to guitar (i.e. a holy roller precursor of rock ’n’ roll), so is Mildred Falls to piano. I was clearly over-dosing on Mahalia at the time, with all the above, plus the double album compilation, This Is Mahalia Jackson, The World’s Greatest Gospel Singer (CBS S 66241) and Mahalia (CBS 62659) consigned to the time capsule, presumably because of musical value and/or condition. What did I choose to keep? What, in other words, is my choice as the defining statement of Mahalia Jackson’s art? Readers, Mahalia (so many Mahalias!) on Columbia EMI 33SX 1698 contains the essence of Mahalia. Those other Duke Ellingtons, by the way, are The Duke Steps Out (RCA, RD-7731), At the Cote D’Azur (Verve, SVLP 9170), and, with Johnny Hodges, Back to Back and Side by Side (VSP 11/12). It's slightly disconcerting to find Ellington sounding so silly on RD-7731. The collaborations with Hodges are pretty indispensable, but I have the two originals in better shape. If I undervalued Duke Ellington, I was also guilty of seriously undervaluing Muhal Richard Abrams. A bunch of mid-80s recordings on Black Saint sound wonderful. Namely View From Within (BSR 0081) and Spihumonesty (BSR 0032). I exclude Duet (BSR 0051), a collaboration with Amina Claudine Myers (piano duets often grate: it’s something to do with all that clashing, jangling activity in the same tonal register). Conclusion: it takes between 85 and 35 years for me to catch up with what the most advanced musicians are laying down. Or as Swamp Dogg put it, Finally Caught Up With Myself. That’s here (Musicor, MUS-2504). It’s lightweight, low budget, but typically irrepressible Dogg. And here’s another production by Jerry Williams, aka Swamp Dogg: Ruby Andrews’ Kiss This (Ichiban, ICH 1104). No disgrace, pretty nifty, albeit hampered by a cheesy 80s production sound. Kiss This was actually recorded in 1991. Not a great year for soul, but neither was 1980, on the evidence of Candi Staton’s self-titled LP (Warner Brothers WB 56 803), which finds the soul belle comprehensively steamrollered by Disco . But, hey, 1974 was a year of wonders. What’s Danger High Voltage by Betty Wright (RCA SF 8408) doing here? The sleeve is worn, but the music! Good times, good lovin’ and good grooves are joyously affirmed. Also in the ‘What Was I Thinking Of?’ category is Dr John, 16 Greatest Hits (Trip, TOP-16-1). Perhaps the unappealing picture of the Doctor on the cover put me off, or the budget label, or the ragbag nature of the collection. Whatever, no matter what the source (plainly someone else – Ronnie Barron? – is singing the wistful ‘Did She Mention My Name’), this is definitive Dr John. ‘Cat and Mouse Game’ prefigures ‘Such a Night’ (love the eccentrically prolonged coda), and Mac sounds as smashed on ‘Trader John’ as he does on Gris Gris; ‘Xmas in New Orleans’ is one of the great unsung Christmas songs and ‘Woman is the Root of All Evil’ has a winningly nonsensical pay-off line (“Money is worse, but it’s legal”). And a 12” single of 1979 vintage, ‘One More Chance’ by Linval Thompson, on Greensleeves, has it all: roots rocking groove, sweet harmonies, a Dub vanishing trick in the extended version: even an irresistible rude toast on the flip, ‘Long Time Me Na Rub You in a Dance’. I must have been mad to part with this! This becomes my refrain as superb LP follows superb LP. What can I say? To open your ears is the basic requirement of music appreciation, and my callow self clearly had hearing issues. It’s becomes particularly useful (opening your ears) when it comes to a spot of jazz. Irina by the Barry Altschul Quartet (Soul Note, SN 1065) is graced by sidemen of the order of Enrico Rava and John Surman. This, in 1983, so just before Surman’s hermit-like withdrawal to the ECM Ivory Tower, and a steady string of one-man albums. Yet Surman’s finest moments are group endeavours, like, oh, Extrapolation, How Many Clouds Can You See and Irina. Did I somehow get the notion that drummers couldn’t also be leaders or composers? If so, I blush at my stupidity, and beg the pardon of Paul Motian, Max Roach, Asaf Sirkis and Barry Altschul. More faulty logic is exposed in this further example of sloppy thinking: if you’ve got Bobby Bland, do you need Geater Davis as well? The short answer is, yes please. The urge to elevate one artist at the expense of another has to be resisted at all costs. So what if some of Geater’s vocal mannerisms recall Bobby Bland? Sad Shades of Blue (Charly, CRB 1132) is gritty, funk-tinged Deep Soul at it’s most assured. And let’s not fall into the Northern Soul trap of venerating the obscure and denigrating the popular. Let’s have James Carr and Otis Redding, Betty(e) Swann and Aretha Franklin, J.J. Barnes and Marvin Gaye. And for that matter, let’s have Bobby Neuwirth and Bob Dylan, Trees and Fairport Convention, Faust and Can. Some broad-minded listeners even find it possible to like both Jim Morrison and Van Morrison, though I remember falling out with a friend of my youth, Andy Shearer, on this point (I was a Van man; he was a Jim man). Feeling Good (United Artists, CH-LA656-G) by Walter Jackson is more penthouse than boudoir, but there’s no gainsaying that impeccable baritone voice. Misty Blue by Dorothy Moore (Malaco #6351) captures the moment when refinement replaced sweeping emotion in soul music. The album’s success established the fortunes of Malaco, a small label operating out of Jackson, Mississippi. By providing a home for veteran old-stagers like Johnnie Taylor, Bobby Bland, Little Milton and Shirley Brown, it could be argued that Malaco rescued Southern Soul Music from extinction. But at a cost. Soul was now a tamed force. Malaco may not have made a bad album, but they haven’t made any great ones either. Typically, Misty Blue slips down smoothly and leaves not a trace. What else? The Best of Gladys Knight & The Pips (Buddah, BDS 5663); essential, but it’s a spare copy. Call Me by Ann Peebles (Naylo, WAY 269509 1); a long way from her glory days. The Sweet Inspirations, Estelle, Myrna and Sylvia (Stax, STS-3017); marooned without Cissy. Talking of whom: Cissy Houston, Mama’s Cookin’ (Charly, CRB 1158). A preponderance of lovey-dovey ballads, a skip or two on one track and the inclusion of ‘I Believe’ consigned Mama’s Cookin’ to time capsule oblivion, when in fact the album approaches soul perfection in quite a few places, notably ‘Midnight Train to Georgia’, which predates Gladys’ version above, and is more down-home, a ‘Long and Winding Road’ that glides as it winds, and a stomping ‘I Just Don’t Know What to Do With Myself’, a lot less glossy than niece Dionne's rendering. Aretha Franklin’s Let Me In Your Life (Atlantic, K50031) is simultaneously the best and worst of Aretha; it misses the good old Muscle Shoals mud. Aretha Franklin, Who’s Zoomin’ Who (Arista, Al8-8286); no comment. Two albums by Joe Simon, Get Down (Southbound SEW 013) and Drowning in the Sea of Love (Southbound, SEW 021); I never really got Joe Simon (I mean nice voice, but...). Oh, and Chuck Jackson, Passionate Breezes (Capitol, SW-11775). A historic album in it’s way, Passionate Breezes defines the budding sub-genre Boudoir Soul, which went on to become the dominant force in the soul/R’n’B market, for better or worse (worse). Boudoir Soul projects a state of blissful sexuality, and tends to carry the pleasure principle to ridiculous extremes. I might be tempted to laugh Passionate Breezes out of the bedroom, were it not for ‘The Train’, first track, side two, which is very, very good indeed: shimmering guitar, a slow groove and pleading vocals. At one point Chuck takes the phrase “I remember the time…”, repeats, expands the statement, and repeats, adding more words again, all the while squeezing the syllables to fit into the limited space of the musical metre. It’s a trick I associate with the folk song ‘The Barley Mow’. Ah, but George Spicer, when he sang ‘The Barley Mow’ (at The Half Moon, Balcombe, Sussex, on the 17th June 1962: cf. The Voice of the People: They Ordered Their Pints of Beer & Bottles of Sherry) didn’t double-track his voice, like Chuck Jackson does here. Is this the first time Chuck Jackson and George Spicer have been mentioned in the same paragraph? Anyway, I digress. It’s significant that the only song on Passionate Breezes that deals with romantic loss, as opposed to gratified desire, is the stand-out cut. Was I down on the blues at the time, I wonder? You Got to Reap What You Sow by Jazz Gillum (RCA Camden, INT 1177) is typical of the pre-war Chicago blues style and there’s nothing wrong with it. Big Foot Country Girl by Mel Brown explores the musical and cultural roots of Brown, a guitarist from the B.B. King school, and incorporates spoken reminiscences and singing from his father, John H. Brown. It’s a funky, bare-arse masterpiece. Faulty logic #2: you can be editor of the foremost folk and roots magazine in the UK (that is, Folk Roots) or a notable bluesman, but not both. I think my issues with Carrion On by Hot Vultures (Best Seller, 4C054-96947), basically Ian A. Anderson and Maggie Holland With Friends, were a) there were no originals by Maggie Holland, whose songs became a fixture of June Tabor’s repertoire, and b) if I wanted to hear ‘You Can’t Judge a Book by the Cover’, I would go direct to Bo Diddley. Oh dear! Talk about false premises. In fact, Carrion On is a little gem: modest, unpretentious and brimful of the joy of casual music-making. If I only looked beyond ‘YCJABBTC’, Carrion On could have opened up an entire cosmology of fabulous, mythical (mostly) USA artists. Carrion On includes covers of tunes by Derroll Adams (‘The Sky’, described as “relatively recent”), The Holy Modal Rounders and (related), the enigmatic Antonia. As it was, I took the long way around to get to the Holy Modal Rounders (it was the connection with Michael Hurley, and where did I find out about Michael Hurley? Why, I read about him in Folk Roots!). Even now, some artists highlighted by Carrion On await discovery. Tracking down Tucker Zimmerman’s self-titled LP on Village Thing might be the task of a lifetime (two Zimmerman songs appear and both are beauties). And skiffler John Pilgrim turns up playing washboard on ‘The Midnight Special’. If anybody knows the whereabouts of John Pilgrim, I would love to talk to him. Not to be mysterious, but my reasons are another story altogether. And that’s where the original posting left off 24 hours ago, rather abruptly, on the cliff-hanging digression, ‘Where are you, John Pilgrim?’ (It’s just that I’m researching a book about Bill Leader, and Pilgrim’s name has cropped up more than once.) Shall I say, simply and directly, some things I omitted to mention, or was going on to develop? Firstly, the reason there is a preponderance of soul, jazz and gospel – did I mention the copious gospel? To keep it brief, can I just say, Myrna Summers and Singers, Give Me Something to Hold On To, Savoy SL 14520 = Good; Rev. Jasper Williams, Jr. Eulogises Rev. C.L. Franklin, A Good Soldier, Church Door Records, CDR-22032 = Bad. As I was saying, the reason there’s such a lot of soul, jazz, gospel and other USA forms is because two thirds of the records came from Yanks/Power Cuts, the record shop, now defunct, which operated from the basement of Canada House, just off Oxford Road (Manchester), and which specialised in cheap cut-outs from the USA. Clearly, I was taking Power Cuts for granted. It’s now second only to Alan Fearnley Records, Linthorpe Road, Middlesbrough, as the record shop I miss most in the whole wide world. Here’s a typical Power Cuts product: Toby by the Chi-Lites, Brunswick BL 754200. It has the trademark Chi-Lites sound – symphonic soul, lush harmonies, ballads that blur the boundaries between extreme romance and extreme creepiness – but I want to mention it because of the inclusion of a cover of ‘The First Time (Ever I Saw Your Face)’, credited to Chesley McCaull! What was that all about? Were Ewan MacColl’s royalties being siphoned off to a Harlem dealer? On the subject of unlikely folk connections – only one LP in the entire batch is overtly folkie and that’s Poetry and Song 3, Argo ZPL 1096 (non-PC; that is, non-Power Cuts), which is a companion to the Voices series: readings and folk song (extended to classical on Voices), a book tie-in, designed for school audiences in the late sixties/early seventies: the producers did the obvious thing and rang Ewan MacColl, who farmed the work to his followers in the Critics Group... While we’re on the subject of unlikely folk connections, as I say, items of Leader interest (because all roads lead back to Bill), include Let Us Get Together by Rev. Gary Davis, on Kicking Mule SNKF 103 (present only because of its distressed condition) with two (very fine) drawings of the Rev. on the back cover by Gloria Dallas, the first Mrs Leader. I didn’t mention the classical contingent, did I? Oh, the usual tatty Pictures at an Exhibition and battered Planets. Best of the bunch is Songs From the Land of the Midnight Sun by Brigit Nilsson, Decca LXT 6185, which I notice fetches up to £50 at current prices. Popsike was a resource we didn’t have when I stocked the time capsule. But the harsh fact is – and this is the reason why there will be no Revenant Records Part 2 – I must get rid of them, and pronto. If I needed to declutter back then, now the situation is far, far worse, and the strain on my shelves has reached crisis proportions. So it’s eBay for the best (apart from the ones I decide to keep, of course), and maybe Wes, my favourite illegal street trader, for the rest. What the hell? Walt Disney’s Snow White and the Seven Dwarfs, Disneyland DQ-1201. How did that get here? Whereas the musty smell, and this is corroborated by personal memory, reveals that Mauricee Jarre’s Academy Award Winning Music From Doctor Zhivago as played by The Metropolitan Pops Orchestra, MFP 1200, is a relic of my own dear parents’ record collection, sneakily slipped into the time capsule by Dad when I wasn't looking. Did you know that John Hartford penned ‘Gentle On My Mind’ in half an hour flat, directly upon returning home from a screening of Doctor Zhivago? And all it makes me want to do is throw a brick at the nearest passing troika.